Mr. Robert “Randy” Smiley began his professional career as a teacher in 1978 teaching biology and chemistry at Carolina Academy in Lake City. One year later, he began teaching at Hannah-Pamplico Middle School where he taught science and gifted and talented. Smiley remained at Florence Two for eleven years as a teacher and as staff development coordinator for three years. In 1993, he transferred to Florence School District Four to serve as assistant to the superintendent. He began serving as assistant superintendent at Florence School District Five in 2001. He was named superintendent of Florence County School District Five on January 2, 2012. 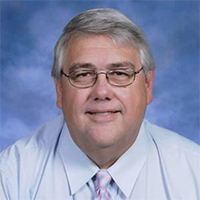 Mr. Smiley attended Francis Marion University receiving a Bachelor of Science Degree in 1978 and Master of Education and Specialist Certificate in Elementary Education in 1990. While attending the University of South Carolina, he received a Master of Education in Administration Degree in 1993 and Education Specialist Degree in Administration in 1995. Currently, Mr. Smiley services as vice chairman of the Pee Dee Education Center. Mr. Smiley is a native of Cades, which is located in Williamsburg County. He comes from a long line of teachers and farmers. He and his wife, Rebecca, have one daughter, Rachel.